The Bible not only tells us that "God is a spirit," but also that "God is love!" (1John 4:8) So God is the Spirit of Love, the Great Spirit, the Creator. What is God like? He's Love! And what did God do to prove that He is Love, that He loves us?--"God so loved the world that He gave His only begotten Son, that whosoever believeth in Him should not perish, but have everlasting life." (John 3:16) God gave "His only begotten Son," Jesus, was separated from Him and let Him suffer a cruel, horrible death for us, for our sakes. "In this was manifested the love of God toward us, because that God sent His only begotten Son into the world that we might live through Him." (1John 4:9) Jesus is the manifestation of the Love of God. "Oh, why can't you just leave Jesus out of it?" some people ask. "Why do you have to use that Name? Why does He always have to be the symbol? Why can't you just say God, and speak of God only? Then we could accept it much easier, if you would not insist on using that Name of Jesus!" Jesus actually renounced the rights of his citizenship in heaven, and "though He was rich, yet for your sakes He became poor that ye through His poverty might be rich!" (2Corinthians 8:9) He adapted Himself to our bodily form and conformed to our human ways of life, that he might understand and love us better, and communicate with us on the lowly level of our own human understanding! In a sense He became a citizen of this world, a member of humanity, a man of flesh, in all points like as we are, in order that He might reach us with His love, prove to us His concern, and help us understand His message in simple childlike terms that we could understand! He came down here to our level to take us with Him back up to His! He's didn't leave the Halls of Heaven to come and stay down here forever! Nor is he still asleep in the grave!--He is risen!--And is now "set on the right hand of the throne of the Majesty in the Heavens" (Hebrews 8:1)--the Throne of the Father--God's Broadcasting Centre--His Central Studio and principal Communication Center, from where He personally directs operations through the power and communication of His Holy Spirit . INDEED THEY ARE!--AND TO DENY THAT THEY ARE GOOD SPIRITS IS TO DENY ALL THE ANGELS AND SPIRITS OF GOD INCLUDING THE HOLY SPIRIT, as well as all the spirits of the dear departed saints of God, including those who appeared or spoke to men of God throughout the Bible, like the souls under the altar in Heaven in Revelation 6:9-11, and even your own personal spirit, saved by the grace of God which shall join a Heavenful of millions of the saved spirits of all the saints of God when you die or go to be with Jesus when He comes! THESE ARE THEY OF WHOM PAUL SPEAKS IN HEBREWS 12:1 AS A GREAT CLOUD OF WITNESSES which compass us about--here and now! "Wherefore, seeing we also are compassed about with so great a cloud of witnesses!" Paul saw them! He knew they were there! Hallelujah! Thank God for His Spirit! Praise God for all His spirits! Thanks be unto God for all the good spirits of God and His saints! THANK YOU, LORD FOR THY MIGHTY DEFENDERS, one of which could handle all the arms of the Enemy! 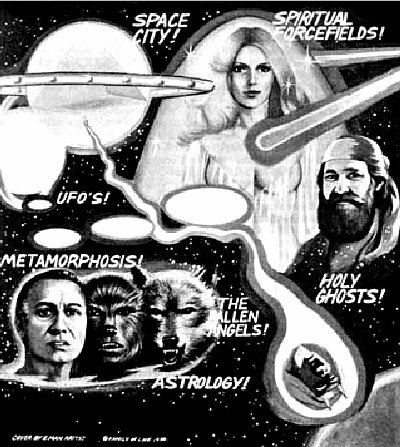 Thank You for these who work with us within the veil of the Fifth Dimension! Thank God for His angels, who are watching over us continually, even your personal angel, whose job is you! Hallelujah! Praise the Lord! The Lord told us one time to thank Him for His angels that guarded and protected us! PRAISE GOD FOR HIS GOOD SPIRITS--ALL OF THEM!--including yours and mine!--And I'm personally acquainted with quite a few others who have spoken to me and through me in many spiritual experiences described in former Letters. In these experiences God has sent different "ministering spirits" to us personally to reveal His mysteries to us in the spirit, by the spirit, through the Spirit, of the Spirit and for the Spirit! SO I KNOW FROM PERSONAL EXPERIENCE THAT SOME OF THE REVELATIONS DO COME IN THIS FASHION.--And why not? They did in the Bible where angelic messengers were sent to convey a message to some prophet of God, or a man or woman of God. Time and again when the prophets revealed something, they said the angel of the Lord or someone else was there showing them. Occasionally, even the angel or spirit of some former man of God, such as Samuel, Moses, Elijah, etc., was used. Search the Scriptures and see if these things be so! IN THE BOOK OF REVELATION FOR EXAMPLE, when the Apostle John was so astonished by the great glad tidings and mysteries of God that a "ministering spirit" was showing him, he wrote, "And I John saw these things, and heard them. And when I had heard and seen, I fell down to worship before the feet of the angel which shewed me these things. Then saith he unto me, See thou do it not: For I am thy fellowservant, and of thy brethren the prophets and of them which keep the sayings of this book: Worship God. (Revelation 22:8,9) This "angel" here was a man, a departed prophet in a supernatural spiritual body. A COUPLE OF DEPARTED SAINTS EVEN APPEARED AND MINISTERED TO JESUS, GOD'S OWN SON! We're told that, shortly before His crucifixion, "Jesus went up into a mountain to pray. And as He prayed, the fashion of His countenance was altered, and behold, there talked with Him two men which were Moses and Elijah: Who appeared in glory, and spake of His decease." (Luke 9:28-31) These two former prophets, Moses and Elijah had departed from this life many centuries previous to the day Jesus was praying on the mount, yet God sent them to counsel and confer with His Son! SO GOD CAN USE HIS SERVANTS WHO HAVE ALREADY PASSED ON FROM THIS LIFE! Our own closest spiritual friend and counsellor, Abrahim the Gypsy King who died as a martyr in Bulgaria in 1272, once told us in a spiritual session, "Since I go to Heaven, I go many many places. Help people, many people. Help many people in time of trouble. God help people. Jesus send me many places. Like angel. I travel much." THESE SPIRITS, THEN, ARE ON ASSIGNMENT. They don't just drift around in space with no place to go, nothing to do, and not knowing what their specific duties are. They're all busy! There're a lot of places where they're working, not only in this world but in the world of the spirit. IN OTHER WORDS, GOD USES THESE SPIRITS AS HIS AGENTS in imparting not only messages and specific powers for specific occasions, but also the particular gifts that each of us are given by the Holy Spirit. SO GOD HIMSELF AND ALL THESE OTHER DWELL AND OPERATE IN THE GLORIOUS UNIVERSE OF GOOD SPIRITS to which His Word welcomes and introduces His born again children: "Ye are come unto the City of the living God, the Heavenly Jerusalem (space City), and to an innumerable company of angels, to the general assembly and church of the firstborn, which are written in heaven, and to God the Judge of all, and to the spirits of just men made perfect, and to Jesus the Mediator of the new covenant." (Hebrews 12:2-24) Hallelujah! AND IT DOESN'T PAY TO TRY AND SAY THAT THERE'S NO DEVIL or no demons or no such thing as evil, and just try to ignore the facts! Especially when God's Book, the Bible, warns us explicitly of such spiritual forces and tells us exactly how to overcome them. BEFORE BECOMING THE DEVIL, SATAN HAD BEEN LUCIFER, the Light-Bearer, the mightiest of all archangels, next to God Himself--he ruled the universe, second only unto God, the very Bearer of the Light! But he wasn't to be the Light. So because he wanted it all and wasn't even willing to share a little, he lost it all! THE DEVIL, HAVING REFUSED TO LISTEN TO EITHER GOD OR THE MAJORITY OF THE ANGELS, WHAT DOES HE DO? Does he then yield and give up and say "So sorry! I was wrong." No, he goes mad, he goes insane, and he screams that he alone has the power to do as he pleases! HE REBELS AGAINST ALL GOVERNMENTS AND ALL PEOPLES AND BECOMES THE DEVIL, SATAN, THE WAGER OF WARS UPON THE WORLD and all peoples and all governments and even God! He is the rebel of all rebels, the terrorist of all terrorists, the backslider of all backsliders, the delinquent of all delinquents, and the criminal of all criminals and the worst monster of all ages! IN THE MEANTIME, HOWEVER, HE'S STILL BUSY TRYING TO BE GOD AND TRYING TO ESTABLISH HIS COUNTERFEIT KINGDOM ON EARTH. You see, he's not really a creator at all, he's only an imitator and destroyer, a fake god! In fact, the Devil can't do anything, he doesn't know what to do, except to imitate God!--Because he knows what God does works! And so in everything he does he is trying to imitate the Lord. IF YOU COULD SEE WHAT WAS GOING ON BEHIND THE VEIL OF THE FIFTH DIMENSION, YOU WOULD WITNESS AN ALL OUT WAR OF THE WORLDS!--A war between good and evil, God and the Devil, goodness and wickedness, flesh and spirit, angels and devils, love and hate, life and death, joy and misery, a war of the universe between the good spirits of Heaven and the evil spirits of Hell, contending for our souls as well as our bodies! IN FACT, I'M PERSONALLY CONVINCED THAT MANY OF THE ANCIENT MYTHOLOGICAL CHARACTERS, EVENTS AND RELIGIONS HAD SOME ORIGINAL BASIS IN ACTUAL FACTS, spiritual personalities and past battles, struggles and occurrences in the spirit world, between good spirits and evil spirits, the angels of God and the demons of Satan! IN THE PROCESS OF TIME AND THROUGH LACK OF SPECIFIC RECORDING OR THE LOSS OF WRITTEN RECORDS, SOME OF THESE ACCOUNTS BECAME CONSIDERABLY CONTORTED, distorted and embellished by word of mouth into some of the odd tales which we have in mythology today, which have been handed down to us from thousands of years ago. WE ARE TOLD IN THE BIBLE THAT THE ARCHANGEL MICHAEL WRESTED AGAINST A DEMON "PRINCE OF PERSIA" FOR 21 DAYS before he finally broke through to answer the Prophet Daniel's prayer with an important prophetic message. (See Daniel 10:11-13,20.) So why could not the gods and goddesses of mythology have been real spirits of ancient times, with their exploits preserved, though somewhat distorted and exaggerated, in the annals of the epics of the Greek and Roman legendary classics! I am convinced that they had a basis in fact in the history of the spirit world! GOD AND HIS SON JESUS CHRIST, THE KING OF KINGS CONDUCT COURT SESSIONS, in which apparently He hears cases and representations, witnesses, for both the Prosecution and the Defense, and makes Judgements accordingly, current Court Sessions in which He judges the living, now, like He did Job and others, like the kings and judges of this world, types and shadows of the True. SO IF JESUS IS IN OUR HEART, HE'S ON OUR SIDE, He's our Intercessor, He's our High Priest. (Hebrews 1-5) The Bible goes on and on about this. Jesus is our Defense Lawyer, He is our Advocate, our Intercessor, our Mediator. He defends us, He intercedes for us and He begs God for mercy. HE SITS AT THE RIGHT HAND OF THE FATHER, PLEADING OUR CAUSE WITH SYMPATHY, EMPATHY AND UNDERSTANDING, Himself having taken on the form of our own human flesh, that He might know and understand us and our problems better, having suffered with us as one of us. "As a father pitieth his children, so the Lord pitieth them that fear Him. For He knoweth our frame; He remembereth that we are dust" (Psalm 103:13,14), having worn that frame Himself, suffering in it, dying in it and now living in it again for all Eternity for our sakes! Thank You Jesus! WE ALSO KNOW THAT GOD CALLS IN HIS CHIEF COUNSELLORS AND SPIRITS AND ANGELS AND ASKS THEM THEIR OPINION AND COUNSEL ON DIFFERENT SITUATIONS. He listens to their different plans and suggestions, and then He has the Godly wisdom to know who is right and to make the right choice! If you don't believe it, read Genesis 1:26; 1Kings 22:19-22; Job 1:6-12, etc.! IN 1KINGS CHAPTER 22, YOU'LL SEE "THE LORD SITTING ON HIS THRONE, and all the host of Heaven standing by Him." The spirits appeared before Him and gave Him different suggestions, and He chose the advice of a particular one, which must mean the others were wrong--or at least their advice wasn't as good. THESE SPIRIT BEINGS, ALONG WITH EVEN THE ANGELS, STILL HAVE A LOT TO LEARN, and God uses such council sessions to try to teach them. Look what happened to the Devil! Look at the experiences the spirits are still having! They're still waging wars and spiritual battles. Quite a few popular films in recent times, such as "The Exorcist," "The omen," "Rosemary's Baby," "The three faces of Eve," etc., have rekindled people's interest in spirits and the spirit world--even though most of these have dwelt on the dark side of the picture, the horror of the Devil and his dirty work. But it shows the world is awakening to these things, and recognising and acknowledging that they're true, although some are trying to explain them away scientifically. You will run into the situation more and more where it's not a problem of disease, or sin, but more and more it will be demon possession. (Revelation 12:12) The doctors and psychiatrists will usually dismiss it as a mental disorder, an insanity, schizophrenia, they often call it, the most common mental disease in the world which occupies more beds in more mental hospitals than any other kind of mental disease--"schizo" meaning "split" or divided personality--they're two different personalities living in the same body. Another spirit has come in and is living alongside of the human spirit in the same body, and that is what has split the personality! The demon enters in and then it's beyond their own control. To a certain point they can control it, but when they submit to the Enemy at some point, then the Devil takes over, unless, of course, you have the Lord. If you have the Lord and ask for His help, you can control it. But of course, if you let it take over and you don't ask the Lord for His help, it can get out of control! I don't believe a child of God can be totally possessed by the Devil. But if you believe his lies, he sometimes seems to be able to take over temporary control, and he can certainly give you hell from the outside! So whatever you do, don't even listen to him, much less believe him or act on his lies! The Christian is the Lord's property and possessed by the Lord and His Spirit and is the Lord's, he belongs to the Lord and is controlled by the Lord. He's the Lord's possession now and the devils can't have him! But of course, if he has some besetting sin, the Devil can use that thing to weaken him or to cause defeat in that particular area of his life, something that's unyielded to the Lord. "Remember, Huddersfield belongs to thee and to me!" In other words, the Devil can say. "Aha, see! He's yielded everything except this one little thing! So even though he belongs mostly to Thee, a little bit still belongs to me!" So don't let the Devil be able to say that of you to God! Don't let him claim any area of your life. Don't give him an inch or he'll take a mile--or more and everything you've got! And let me warn you: He plays for keeps! So don't let it happen to you! "Submit yourselves therefore to God. Resist the Devil, and he will flee from you!" (James 4:7) Don't even let the ol' camel get his nose in or he'll soon have the entire tent! "Neither give place to the Devil!" (Ephesians 4:27) Hallelujah! But what about the cases of so-called witchcraft , wizardry, black magic, etc., where individuals fiddle around with spiritual powers, trying to influence or cast spells on other people? Well, just as God has His means of communication in the spirit world, so does the Imitator, the Devil. Just like God has His children, the Devil has his captives. Just like God's spirit can possess us, God's children, the Devil's spirit can possess his children. And therefore, so called witchcraft, demonology, etc., are realities in the world of the evil spirits of the Enemy. God's children can pray to the Lord and ask Him to answer and affect certain people for good, and so can the Devil's children communicate with him and project. God has given the Devil certain powers, particularly over his children, those who aren't protected by the Spirit of God, those who have rejected Christ. But the Lord gives people a certain immunity to the influence of Satan up to the point of decision. But, "He that being often reproved and hardeneth his neck, shall suddenly be destroyed!" (Proverbs 29:1) Every time they resist the truth they are hardening their spirit against the Lord, and therefore, if they reject the truth, they receive strong delusion that they may believe a lie.--Those who are the Devil's children, at least. (2Thessalonians 2:10,11) Until someone reaches that point and if he's not made the final decision, as long as God's Spirit is still dealing with him, he still has a certain immunity or merciful protection against the Enemy's power. In the case of witchcraft and wizardry, the Enemy acts as a relay station. Satan's child communicates with the Devil and if it's in accordance with the Devil's will, and not beyond the powers God has given him, then he can operate to influence other children of the Devil, one way or the other. Science of course would call this telepathic hypnosis. But no matter what scientific names they call it, it's still spiritual power in operation in the realm of the spirit!--And if they don't have the Lord in their heart it has to be the Devil no matter what good they are trying to do. Things are either controlled by the Lord or the Devil. It takes faith in either case, so it's all in the realm of the spirit. The difference is that God's power is creative and loving, but the Devil's power is destructive and hateful. What is the Devil usually doing with his wizardry and his black magic? And what do they call that stuff with the zombies in the islands--voodoo! What is most of it used for? Curses!--for curses for people who hate people and who want to curse them. But we don't have to fear, because we have a greater power that protects us. Even if they get a dolly of you and go to this devil-man for the pins and he sticks the pins into your dolly, nothing's going to hurt you at all because God is there protecting you and the Devil can't touch you. The power of the Lord, of course, is so much greater! his Word tells his children: "Greater is He that is in you than he that is in the world," (1John 4:4) In other words God is saying, "My power in you is much greater than the Devil's power in the world's children, his children.--Much greater!" Their power is so puny compared to ours and is so weak and ridiculous compared to the power of God that they're like little kids playing with matches while we've got lightning bolts! So we don't have to worry about or fear Satan's puny power because we are protected by the power of the Holy Spirit, which is far greater than the power of the Enemy. If we have the power of the Lord, if we have Christ and the Holy Spirit, we are overshadowed, we are enveloped. The Lord's protection is just like a force field around us and the Enemy cannot penetrate it! It's impossible for him to penetrate it unless the Lord allows him to do it as a spanking, as a chastening, as a reaping of something you have done that you haven't confessed or you're not sorry for. Then the Lord allows you to reap the results. But the Devil can't do a damn thing, a real damn thing, without God's permission, without authorisation from the Lord.--He can't touch you! He can't let one of his demons touch you, he can't do a thing, nothing, as long as you have the Lord's power and are in His will. It's amazing the power the Lord gives us! Almost the Devil's total power is in fear. But the moment the Lord's children are tempted to fear, we immediately think of God and the fears vanish!--Anything that is not of the Lord just vanishes! "For God hath not given us the spirit of fear; but of power, and of love, and of a sound mind!" (2Timothy 1:7) Hallelujah! "For perfect love casts out all fear!" (1John 4:18)--And "God shall keep him in perfect peace whose mind is stayed on Him because he trusteth in Him!" (Isaiah 26:3) Praise God forever! God is bigger than any devil! THERE COMES A TIME FOR EVERYONE TO PASS FROM THE FLESH TO THE SPIRIT WORLD--DEATH. It's really very simple: Leaving this life is just like going from one room into another and closing the door. Everybody does it when they die! Death is the Devil's due. He's like the death angel. Death is the penalty of physical sin and we all have to suffer the penalty physically of death. Because according to God's laws because of the disobedience of Adam and on down, we all have to die because of disobedience and sin! "By one man (Adam) sin entered into the world, and death by sin: and so death passed upon all men, for all have sinned." (Romans 5:12) The Devil is like the executioner. God won't let him execute us before our time, but sooner or later He has to let the Enemy take our life and bring death to keep His Word, and we suffer the penalty of death physically. But instantly, the minute God's children die, although the Devil gets to fulfill the Law to execute and take our life physically, we're instantly freed spiritually, liberated from the flesh into the world of the spirit. So this is why Paul said and flaunted in the face of death, "O death, where is thy sting? O grave, where is thy victory?" (1Corinthians 15:55) In other words, we have to die to pay the penalty, but Jesus took the sting out of it. It's an empty victory for the Devil because he can't get us. And actually it's like an escape hatch for us because he can't have us and really take us. Although he's allowed to fulfill the debt, it really escapes his hand. This is why Jesus said, "Thou shalt not taste of death." (Matthew 16:28) He's talking about spiritually there, because we all die.--"It is appointed unto men once to die." (Hebrews 9:27) But we'll never really die in that sense of spiritual death, or taste the agony of death and separation from God, thanks to Jesus' sacrifice and atonement. "I am the resurrection and the life," Jesus said, "he that believeth in Me, though he were dead, yet shall he live: And whosoever liveth and believeth in Me shall never die!" (John 11:25,26) He's the only One Who can deliver us out of the jaws of death so we pass through it without sting--through the grave with victory for us, not the grave! Hallelujah! So for the saved, those that know the Lord, dying is the easiest thing in the world! I means it's so easy to die when you're a Christian, because you know where you're going. It's not hard to die if you want to die, you can practically will yourself to die. It's an abandoning of this world and a desire for the other. It's like all the Old Testament patriarchs DID, they just gathered the family around and they said their goodbyes and gave their last instructions and they prophesied over them and so on, and then just said goodbye and they gave up the ghost.--They gave up the ghost, they deliberately yielded up their spirit. You can choose to die if you want to. I've almost died a lot of times and once I DID. Even after I died that time I had such a will to want to come back, and I prayed, "Lord, let me return to my body!" It's a wonderful feeling, though, it's great! I mean you're lighter than a feather, you feel like you're floating on air when you're rid of this body. It's similar, I presume, to what the astronauts feel in their weightlessness. Right now we're burdened by this vile body. But praise God, in the spirit you don't have this weight! You're no longer weighed down with the flesh and burdened with the problems of this physical life. You've graduated from this grade of this earthly life!